In 1933, three strange dolphins were beached off the Irish coast; these appeared to be hybrids between Risso's Dolphin and the Bottlenose Dolphin. This mating has since been repeated in captivity and a hybrid calf was born. In captivity, a Bottlenose Dolphin and a Rough-toothed Dolphin produced hybrid offspring. A Common-Bottlenose hybrid lives at SeaWorld California  Various other dolphin hybrids live in captivity around the world or have been reported in the wild, such as a Bottlenose-Atlantic Spotted hybrid. The best known hybrid however is the Wolphin, a False Killer Whale-Bottlenose Dolphin hybrid. The Wolphin is a fertile hybrid, and two such Wolphins currently live at the Sea Life Park in Hawaii, the first having been born in 1985 from a male False Killer Whale and a female Bottlenose. Wolphins have also been observed in the wild. Until recently only a few benthic species of shark, such as hornsharks, leopard sharks and catsharks had survived in aquarium conditions for up to a year or more. This gave rise to the belief that sharks, as well as being difficult to capture and transport, were difficult to care for. 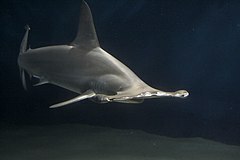 A better knowledge of sharks has led to more species (including the large pelagic sharks) being able to be kept for far longer. At the same time, transportation techniques have improved and long distance movement of sharks is becoming easier. One shark that never had been successfully held in captivity for long was the great white. 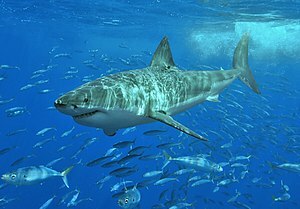 But in September 2004 the Monterey Bay Aquarium successfully kept a young female great white shark for 198 days before releasing her back into the wild. Most species of shark are not suitable for domestic aquaria and not every species of shark sold by pet stores make good inhabitants for personal aquaria. Some species of sharks can also be kept well in home saltwater aquaria. Uninformed or unscrupulous dealers sometimes sell juvenile sharks like the nurse shark, which upon reaching adulthood will have far outgrown typical home aquaria. Public aquaria are generally not interested in accepting donated specimens that have overgrown their housing and some shark owners have been tempted to release them into the wild. Species appropriate to home aquaria represent considerable spatial and financial investments as they generally approach adult lengths of 3 feet and can live up to 25 years. All sharks are carnivorous and many people believe that sharks will eat just about anything; for a few species, such as the tiger shark, this is true. The vast majority of sharks, however, are far more specialised for particular prey items, and rarely stray from these. Some of the most specialised sharks have developed a filter feeding technique, which is employed by the whale, basking and megamouth sharks. These three shark species have evolved plankton feeding independently and use different strategies. Whale sharks feed using suction to take in large concentrations of plankton and small fishes. Basking sharks are ram-feeders, swimming steadily, with their mouth wide open, through plankton blooms. Megamouth sharks may make their suction feeding extra efficient with the use of luminescent tissue inside the mouth the attract prey in the deep ocean. This type of feeding was only possible through the evolution of gill rakers, long slender filaments that form a very efficient sieve, analogous to the baleen plates of the great whales. Plankton is trapped in these filaments and swallowed from time to time in huge mouthfuls. Teeth in these species are very small compared to the size of the animal, because they are not needed for feeding. Sharks have keen olfactory senses, located in the short duct (which is not fused, unlike bony fish) between the anterior and posterior nasal openings, with some species able to detect as little as one part per million of blood in seawater. They are more attracted to the chemicals found in the guts of many species, and as a result often linger near or in sewage outfalls. Some species, such as nurse sharks, have external barbels that greatly increase their ability to sense prey. Sharks (superorder Selachimorpha) are a type of fish with a full cartilaginous skeleton and a highly streamlined body. They respire with the use of five to seven gill slits. Sharks have a covering of dermal denticles that protect their skin from damage and parasites and improve fluid dynamics. They have several sets of replaceable teeth. Sharks range in size from the small dwarf lanternshark, Etmopterus perryi, a deep sea species of only 17 centimetres (7 in) in length, to the whale shark, Rhincodon typus, the largest fish, which grows to a length of approximately 12 metres (39 ft) and which feeds only on plankton, squid, and small fish through filter feeding. The bull shark, Carcharhinus leucas, is the best known of several species that swim in both seawater and freshwater, as well as in deltas. The popular image of a goldfish in a fishbowl is an enduring one. However, some countries have banned the sale of bowls of that type under animal rights legislation due to the risk of stunting, deoxygenation and ammonia/nitrite poisoning in such a small environment. Because of their large oxygen needs and high waste output, the popular goldfish bowls of the past are not appropriate housing for goldfish. Like most carp, goldfish produce a large amount of waste both in their feces and through their gills, releasing harmful chemicals into the water. This also happens because goldfish, like other cyprinids, lack a stomach and only have an intestinal tract, and thus cannot digest an excess of proteins, unlike most tropical fish. Build-up of this waste to toxic levels can occur in a relatively short period of time, which is often the cause of a goldfish's sudden death. Because of this, goldfish need a large volume of water in which to live. For common and comet varieties, each goldfish should have about 20 gallons(US) or 75 liters of water. Fancy goldfish (which are smaller) should have about 10 gallons(US) or 37.5 liters per goldfish. The amount of 'water surface area' is also important in determining how many goldfish may live in a container, as water surface area determines how much oxygen diffuses and dissolves from the air into the water. A general rule is have one square foot of water surface area for every inch of goldfish length (370 cm²/cm). If the water is being actively aerated by way of a water pump, filter or fountain, a smaller volume of water is needed. Goldfish are popular pond fish, since they are small, inexpensive, colourful, and very hardy. In an outdoor pond or water garden, they may even survive if brief periods of ice form on the surface, as long as there is enough oxygen remaining in the water and the pond does not freeze solid. Common goldfish, London and Bristol shubunkins, jikin, wakin, comet and sometimes fantail goldfish can be kept in a pond all year round in temperate and subtropical climates. Moor, veiltail, oranda and lionhead can be kept safely in outdoor ponds only in the summer, and in more tropical climates. Small to large ponds are fine though the depth should be at least 80 cm (30 in) to avoid freezing. During winter, goldfish will become sluggish, stop eating, and often stay on the bottom of the pond. This is completely normal; they will become active again in the spring. A filter is important to clear waste and keep the pond clean. Plants are essential as they act as part of the filtration system, as well as a food source for the fish. Plants are further beneficial since they raise oxygen levels in the water. The Common, Comet, and Shubunkin varieties of goldfish are similar to wild carp (except for colour). They are hardy and can grow to a large size. Other more fancy varieties have been developed. The main fancy varieties are: Black Moor, Bubble eye, Butterfly tail, Calico, Celestial eye, Fantail, Lionchu, Lionhead, Oranda, Panda Moor, Pearlscale, Pompom, Ranchu, Ryukin, Telescope eye, and Veiltail. Rare fancy varieties include: Tosakin or curly fantail, Jikin or peacock tail, Shukin, Tamasaba or sabao, Meteor goldfish, Egg-fish goldfish, Curled-gill goldfish or reversed-gill goldfish, Mirror-scale goldfish. The goldfish has a fairly self explanatory name: "gold" describing its color, and "fish" describing its species. Goldfish are a relatively small member of the Cyprinidae or carp family. The Cyprinidae family is the largest family of freshwater fishes in the world. Apart from the goldfish, other well-known members include the minnow, chub, shiner, zebrafish, various Asian carps and koi. Selective breeding over centuries has produced many different color variations, some of them far removed from the 'golden' color of the original goldfish. There are also different body shapes, fin and eye configurations. Some extreme versions of the goldfish need to be kept in indoor aquariums as they are much less hardy than varieties closer to the "natural" original. However, some varieties such as the Shubunkin are hardier, and can be kept in outdoor pools. In 1162, the Empress of the Song Dynasty ordered the construction of a pond to collect the red and gold variety of those carp. By this time, people outside the imperial family were forbidden to keep goldfish of the gold (yellow) variety, yellow being the imperial color. This is probably the reason why there are more orange goldfish than yellow goldfish, even though the latter are genetically easier to breed. The occurrence of other colors (apart from red and gold) was first recorded in 1276. The first occurrence of fancy tailed goldfish was recorded in the Ming dynasty. In 1502, goldfish were introduced to Japan, where the Ryukin and Tosakin varieties were developed. In 1611, goldfish were introduced to Portugal and from there to other parts of Europe. In ancient China, various species of carp (collectively known as Asian carps) had been domesticated and reared as food fish for thousands of years. Some of these normally gray or silver species have a tendency to produce red, orange or yellow color mutations; this was first recorded in the Jin Dynasty (265–420). During the Tang Dynasty (618–907), it was popular to raise carp in ornamental ponds and watergardens. Due to a natural genetic mutation, some of these carp displayed gold (actually yellowish orange) rather than silver coloration. People began to breed the gold variety instead of the silver variety, and began to display them in small containers. The fish were not kept in the containers permanently, but would be kept in a larger body of water, such as an outdoor pond, and only for special occasions at which guests were expected would they be moved to the much smaller container. Goldfish (Carassius auratus) are small ornamental freshwater fish that are commonly kept as pets. Goldfish were one of the earliest breeds of fish to be domesticated and are still one of the most commonly kept fish in aquariums and outdoor water gardens. Goldfish were originally domesticated from the Prussian carp (Carassius gibelio), a dark greyish brown carp native to Asia. It was first bred for color in China over 1,000 years ago. Due to selective breeding, goldfish have been developed into many distinct breeds and are now found in various colors, color patterns, forms and sizes far different from those of the original domesticated carp. 297 words are in this fish description. Fish descriptions are reserved for LBF members. Please login now or register today. 225 words are in this fish description. Fish descriptions are reserved for LBF members. Please login now or register today. 370 words are in this fish description. Fish descriptions are reserved for LBF members. Please login now or register today. World Record: 13 lbs. 1 ounce, Ont. 352 words are in this fish description. Fish descriptions are reserved for LBF members. Please login now or register today. 314 words are in this fish description. Fish descriptions are reserved for LBF members. Please login now or register today. The International Game Fish Association (IGFA) is the leading authority on angling pursuits and the keeper of the most current World Record fishing catches by fish categories. Fishermen who are sport fishers are careful to follow their stringent rules for fair play and line requirements in order to receive the honor of being listed in their annual “World Record Game Fishes" publication. The publication also gives fishing tips, and has an extensive fish identification guide. The IGFA is also an ardent proponent of aquatic habitat conservation, and cooperates with biologists all over the world. A random assemblage of fishes merely using some localised resource such as food or nesting sites is known simply as an aggregation. When fish come together in an interactive, social grouping, then they may be forming either a shoal or a school depending on the degree of organisation. 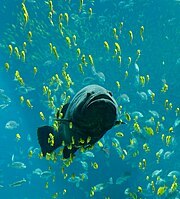 A shoal is a loosely organised group where each fish swims and forages independently but is attracted to other members of the group and adjusts its behaviour, such as swimming speed, so that it remains close to the other members of the group. Schools of fish are much more tightly organised, synchronising their swimming so that all fish move at the same speed and in the same direction. Shoaling and schooling behaviour is believed to provide a variety of advantages. As of 2006, the IUCN Red List describes 1,173 species of fish as being threatened with extinction. Included on this list are species such as Atlantic cod, Devil's Hole pupfish, coelacanths, and great white sharks. Because fish live underwater they are much more difficult to study than terrestrial animals and plants, and information about fish populations is often lacking. However, freshwater fish seem particularly threatened because they often live in relatively small areas. For example, the Devil's Hole pupfish occupies only a single 3 m by 6 m pool. Although most fish are exclusively aquatic and ectothermic, there are exceptions to both cases. Fish from a number of different groups have evolved the capacity to live out of the water for extended periods of time. Of these amphibious fish, some such as the mudskipper can live and move about on land for up to several days. Also, certain species of fish maintain elevated body temperatures to varying degrees. Endothermic teleosts (bony fishes) are all in the suborder Scombroidei and include the billfishes, tunas, and one species of "primitive" mackerel (Gasterochisma melampus). All sharks in the family Lamnidae – shortfin mako, long fin mako, white, porbeagle, and salmon shark – are known to have the capacity for endothermy, and evidence suggests the trait exists in family Alopiidae (thresher sharks). The degree of endothermy varies from the billfish, which warm only their eyes and brain, to bluefin tuna and porbeagle sharks who maintain body temperatures elevated in excess of 20 °C above ambient water temperatures. See also gigantothermy. Endothermy, though metabolically costly, is thought to provide advantages such as increased contractile force of muscles, higher rates of central nervous system processing, and higher rates of digestion. The early fossil record on fish is not very clear. It became a dominant form of sea life and eventually branched to create land vertebrates. The proliferation was apparently due to the formation of the hinged jaw because jawless fish left very few descendants. Lampreys may be a rough representative of pre-jawed fish. The first jaws are found in Placodermi fossils. It is unclear if the advantage of a hinged jaw is greater biting force, respiratory-related, or a combination. Some speculate that fish may have evolved from a creature similar to a coral-like Sea squirt, whose larvae resemble primitive fish in some key ways. The first ancestors of fish may have kept the larval form into adulthood (as some sea squirts do today), although perhaps the reverse of this is the case. Candidates for early fish include Agnatha such as Haikouichthys, Myllokunmingia and Conodonts.